Back in the nineties before the popularization of mobile phones, every village, shopping centre, public spaces typically had one or more public telephones. In fact, public telephones were so popular, there were often queues of people wanting to use them! The first public call box was installed in Dublin in 1925. 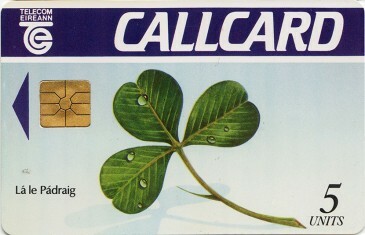 Move on 63 years, which saw the introduction of Telecom Eireann Callcards in the year 1988, with the first trial commencing in Dublin. Read more about the Callcard trials here! Throughout the years Telecom Eireann rolled out many different phonebox styles and this article is going to discuss the three most common types of phonebooth you were likely to come across if you were to use a cardphone. Do you have any photos of Irish phoneboxes you would like to share with us? If you do why not send them on? :) . This guide to the chipsets used on Telecom eireann and Eircom Callcards will allow you to easily identify the different chipsets used on various Callcards produced. These small EPROM chips are factory programmed with a set amount of units, in quantities of 5, 10, 20, 50 and 100 Units for the consumer market. These units are stored in a protected area of the chipset, and after programming a fuse is blown to ensure that while erasing is possible, recharging is not. It should be noted that some test cards did contain more than 100 units, however these were never available to consumers. In theory a chipset could store hundreds of units, some of the modern chipsets could store thousands. Smart cards with chips are still used in a wide variety of applications today, including banking cards, mobile phone SIM cards and building access cards. This guide will offer a brief introduction to the companies who produced the chips, and also visual images to help with chipset identification. Another point to note is that not all manufacturers produced their own chips. It was quite common for manufacturers to use chips produced by companies such as Siemens. Schlumberger produced all their own chips.